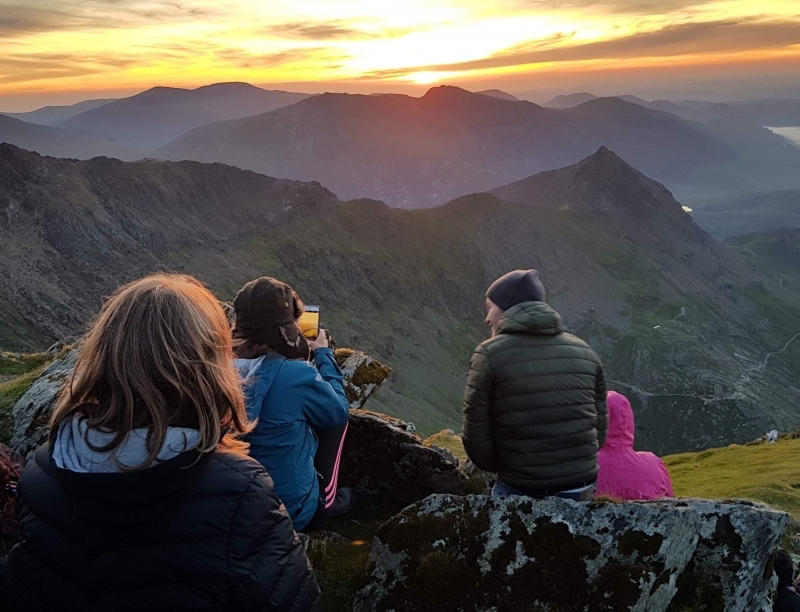 It’s easy to understand why climbing to the summit of Snowdon to watch the sunrise is one of our most popular adventures. During daylight hours Snowdon is a wonderful challenge. Taking it on in the dark brings a whole new adventure in itself. 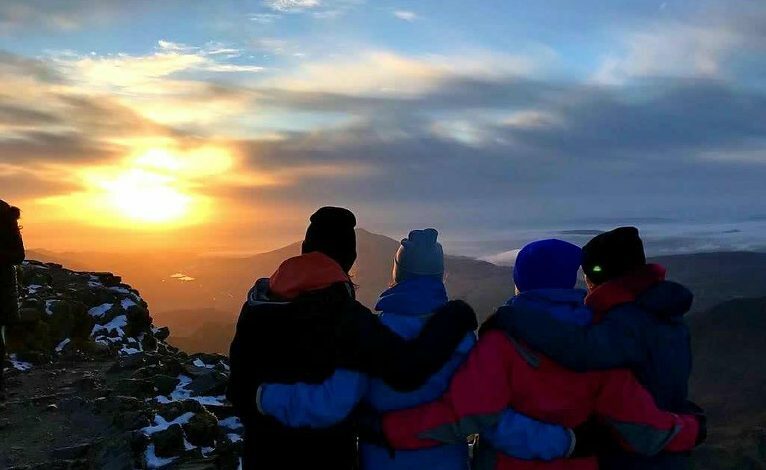 Climb to the summit of Snowdon to see the sunrise across Snowdonia. Enjoy the start of a brand new day with views across the mountains and coast from Wales’ highest mountain. Snowdon, or Yr Wyddfa to use its Welsh name, stands at 1085 metres and is the highest mountain in Wales (and England). Its rugged beauty attracts people from all over the world. Views from the summit have been voted the best views in the UK. Never be worried about coming along on your own. There’s always a lovely group of people on these challenges and you’ll be one of the team. 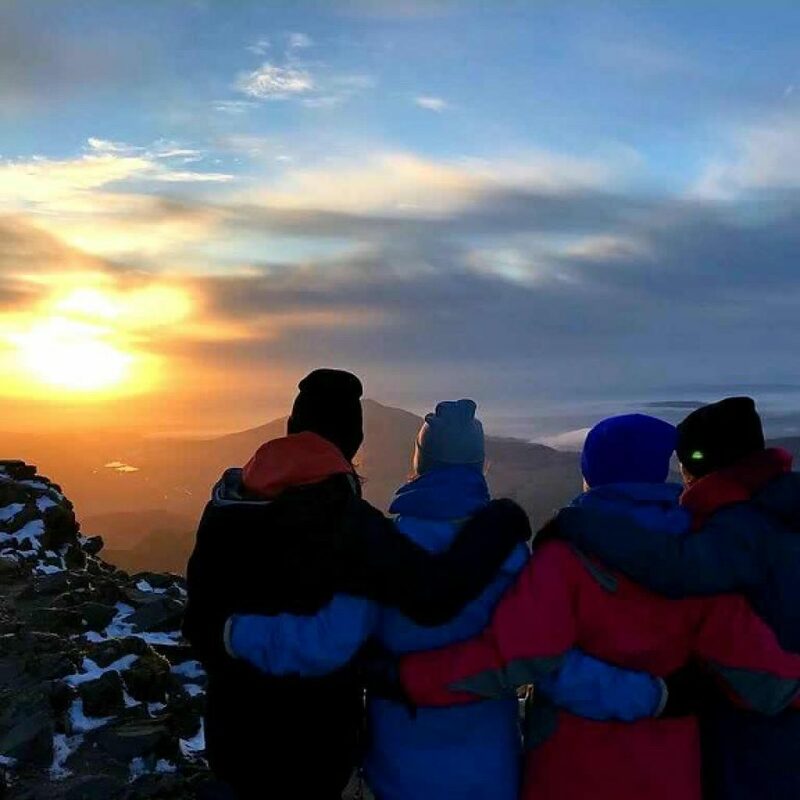 You can join one of our scheduled Snowdon Sunrise dates by clicking on the Book Now button. If there’s a group of you and you’d like to book for 4 or more people on one of our scheduled dates just click on the Book Now link and select the Group Ticket. We can arrange private dates for groups off 4 or more. If you have a particular date in mind please Contact us. 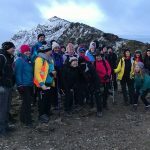 Our Snowdon Sunrise challenge has been a fantastic fundraising adventure for a number of groups and charities in 2018. if you are a group or charity and would like to take part in one of our scheduled dates or arrange a private date please get in touch. 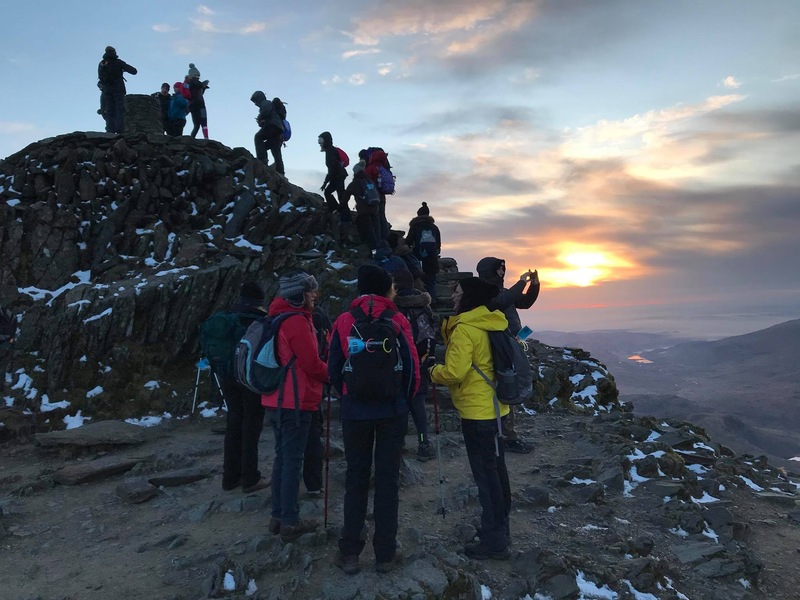 In 2018 we helped nearly 300 people reach the summit of Snowdon in time to see the sunrise. 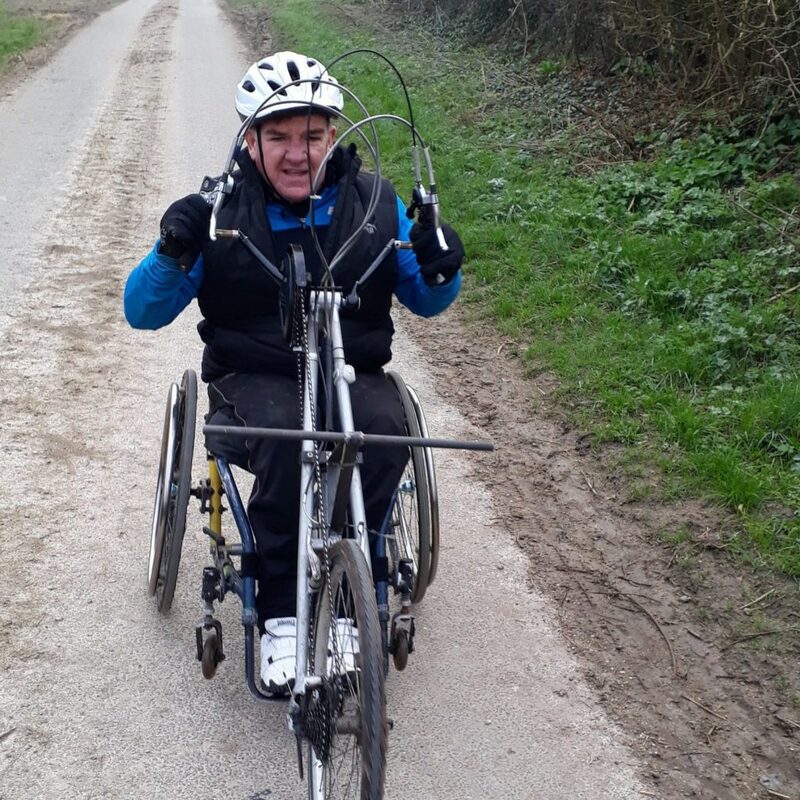 From booking your adventure you will have all the support and information you need including advice on Training for you challenge and the Kit you will need. The better prepared you are the better experience you will have and the memories you will take home with you will last a lifetime. Safety is our priority. 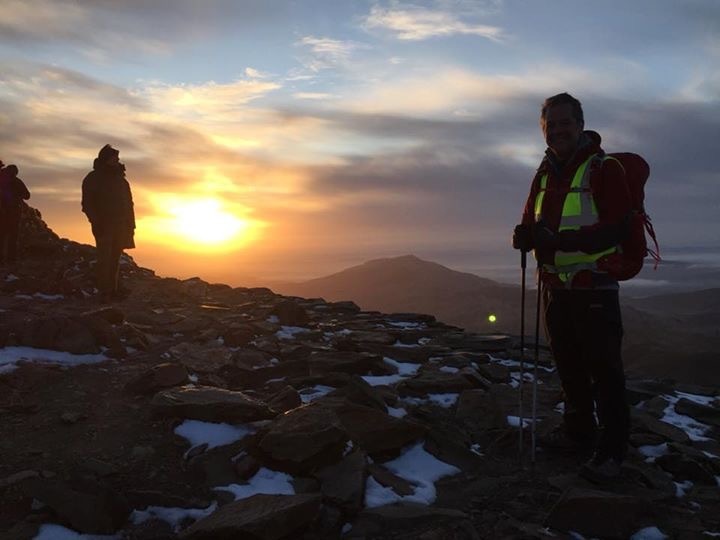 At each of our Snowdon Sunrise challenges you will be accompanied by the best, professional mountain leaders. They will be there to support, guide and encourage you all the way to the summit and back down. You will set off in the early hours by the light of the stars and your head torch, taking the Llanberis Path to the summit. Please note your walk will start in the early hours of the date listed. So if you book to join us on 2nd August this is 1.30am on Friday 2nd August, therefore you will need to travel on Thursday night. You’ll set off around 1.30am. Your leaving time will be confirmed in your Information pack which will be sent to you 2 – 3 weeks before. Congratulations you have completed your challenge. Your certificate will be emailed to you. Sunset challenges will set off approximately 3-4 hours before sunset. It can surprise walkers how tough Snowdon can be. Our team will be there to support you but you should be confident of your ability to take part in this challenge. We have 12 weeks Training Plans you can download. We recommend you are comfortable with the Challenging Plan for this walk. All walkers should be over 14. Any under 18’s should be accompanied by an adult. Please select the Adult and Child ticket when you book. if you have a specific date in mind please contact us. Please note that, although we would love to, we cannot guarantee a clear sunrise for this event! The organisers hold Public Liability Insurance. We recommend that you take out separate personal accident insurance for this event. Please see our Mountain Kit List for a comprehensive list of what you will need to wear and carry. Please note not having the recommended kit may compromise your ability to start or complete your challenge.